As the name implies the stand is portable, weighing only 5.5 ounces, and when folded is 3/4″ thick. Unfolding the stand creates a triangular base 3-1/4″ high. Folding the stand for storage and unfolding for use is quick and literally a snap. The polypropylene end caps are key to the stand’s pop and snap feature. With the stand on its base, the laptop can be placed at a comfortable typing angle. The Aviiq Portable Quick Stand is extremely stable considering its size. It is composed of a German patented material that Aviiq claims provides the stand’s lightweight and durability. I love this laptop stand. Anyone looking to reduce the weigh of the gear in their laptop bags will have no problem adding the Aviiq Portable Quick Stand. Unfortunately, at $39.99 the company may have priced the stand a bit too high for me to consider it a must-have stocking stuffer. With five different colors, cerulean blue, magenta, onyx black, slate gray, and chartreuse green, there’s a color that will appeal to practically anyone. The packaging for the stand is also minimal, which I’m sure will be appreciated by the environmentally conscious consumer. Other than the price, my only other complaint is that the height is not adjustable. The 3-1/4″ height creates a 12 degree angle that may not be a comfortable typing angle for some users. The stand can be rotated to create a negative 12 degree angle suitable for raised or standing view. Even with the current price and height short-comings, I am considering purchasing a chartreuse or cerulean blue stand to toss into my laptop bag. 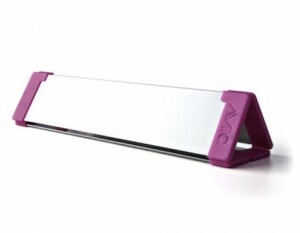 The Aviiq Portable Quick Stand is a cleverly thin and attractive little stand. Aviiq’s 30-day money back guarantee is a clear indication that they stand by the quality of the product.